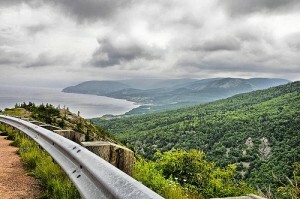 The spectacular Cabot Trail on Cape Breton island is undoubtedly Nova Scotia’s most beautiful drive. If you only have a short time in the province, you won’t regret focusing your attention here. From stunning ocean views to isolated bays and coves, misty mountain peaks, colourful fishing villages and rushing waterfalls, it’s not hard to see why the Cabot Trail is known as one of the world’s best road trips. It’s just one breathtaking view after another. It’s possible to drive the whole 296km loop in a few hours but there’s so much to see and do that it’s better to set aside 2-4 days. That way you can take your time enjoying the hiking, golfing and many other activities on offer. Taking Highway 105 west from Baddeck, Exit 7 is the first chance to get onto the Cabot Trail but the diversion a little further south to Mabou is worth the effort. Here in this musical village, you could be forgiven for thinking you’ve accidentally been transported to Scotland. Gaelic is still taught here and the locals often gather for ceilidhs – traditional evenings of fiddle playing, songs, dancing and storytelling. The best way to find out what’s happening is to ask the locals, maybe while you’re tucking into some hearty home cooking at The Mull Café and Deli. Or drop by the Red Shoe Pub, which often hosts musical evenings. A short distance up the road, stop at the Glenora Distillery, the only place in North America making single-malt whiskey. Take a tour or stay the night to enjoy the fine attached hotel and restaurant. As you enter the park, the road rises through a valley on cliffs that tower 300 meters above the water. Stop at one of the many lookout points to admire the views over the Bay of St. Lawrence and the hills and keep your eyes open. It’s quite common to see eagles soaring overhead and occasionally whales swim just offshore. Continuing north, the Cabot Trail veers inland for a short stretch, before coming back to the coastline briefly at the tiny fishing village of Pleasant Bay. This could be that quiet place you’ve been searching for to watch the sunset and feast on seafood. Take some time too for the Whale Interpretive Centre, and its exhibits on everything from how whales evolved to modern challenges faced by these majestic marine mammals. From Pleasant Bay, the road turns inland once again, leaving the national park and heading for Cape North. 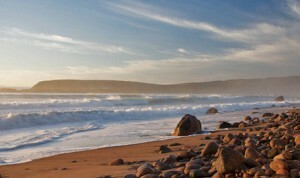 Here there’s a fantastic side trip along Cape Breton’s most isolated coastline. A dead-end road leads through North Harbour, Capstick and finally along a dirt stretch to Meat Cove, where you can pitch your tent to some jaw-dropping views at the local, rustic campground. You can practically watch for whales while still tucked up in your sleeping bag or ask the owners about where to go hiking. Flower enthusiasts will enjoy the rare orchids that grow in the area. Nearby Bay St. Lawrence also offers fine views and if it’s whale-watching from the water you’re after, then get in touch with Captain Cox – a renowned tour operator. There’s a campground here too but if you want a bit more luxury, start the return drive to Cape North and stop at Four Mile Beach Inn, a heritage property that’s full of character. Back on the main road, the Cabot Trail veers southeast, skirting close to Neils Harbour. The short diversion to this hamlet earns you the right to sample a fine bowl of seafood chowder at the local Chowder House, right beside the lighthouse. It’s perfect for a picnic but do come prepared for the crowds and bus tours on summer weekends. The resort area of Ingonish is your next stop and arriving here can be a bit confusing: aside from Ingonish itself, there’s also Ingonish Beach, Ingonish Centre, South Ingonish Harbour and Ingonish Ferry. 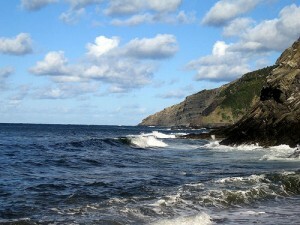 Ingonish Beach is a nice place to stop for a swim. For a dip in the water, it’s Ingonish Beach you’re after, where you can choose between freshwater or saltwater swimming, followed by a walk along the lake. Ingonish Centre is where you’ll return to the Cape Breton Highlands National Park and the premier place to stay is undoubtedly the Keltic Lodge resort, while golfers will want to head straight for Highland Links, one of the best golf courses in all of Canada, if not North America. Now your time on the Cabot Trail is nearly at an end but not before the road climbs steeply to Cape Smokey. Stop at the top to soak in the scenery or tackle the energetic 11km hike to the very end of the cape. Down the other side of the hill, there’s a tough choice to be made. You can either continue on the main route through Tarbotvale and St. Anns, visiting the many artisans along the way, or nip down to Jersey Cove where a 24-hour ferry runs to Englishtown across the bay for just $5. In Englishtown, park the car and board another ferry to the rugged Bird Islands, where you can see everything from whales and seals to colourful puffins in their nesting habitat. Donelda’s Puffin Boat Tours is one operator that consistently wins high praise. Whichever option you chose, it’s now just a short journey back down Highway 105 to Baddeck, where your trip around the Cabot Trail began.